In reading Jen’s post, I realized this isn’t something the 3 of us gluttons have discussed, but it is a big deal! Eating gluten-free is expensive and it hurts to see gf food go into the trash because I didn’t plan properly. Back before Matt and I were see Dr. Woo Woo, I’d make a meal plan, but we’d get tired or lazy or have a bad day (or all three) and decide we needed to eat out instead of cooking whatever was on my menu. Then we’d have leftovers from eating out, which would take over another slot, and before I knew it I’d have way more groceries than we could consume just rotting in my fridge. I’ve become incredibly cognizant of this since both my husband and I are gluten, grain, dairy, and sugar free right now. Eating out is no longer so easy, so I’ve made it my mission to eat what we buy and not have so much wasted food! 1.) Organization. This step is crucial! Once Dr. Woo Woo handed us down Phase 1 and 2 diets, I went home and cleaned out my fridge, pantry, and freezer. Non-perishables that I knew would be back on the menu after we graduated to Phase 3 went on the reeaaallly high or bottom shelves in the pantry (aka not on eye level). The stuff I’m most tempted by went so high I’d need to get a ladder to get it down. Usually laziness will prevent me from getting the ladder out to climb up there! Once the bad stuff was in a bag to donate, I organized so that everything was easy to find. I even have a spot for my husband right at his eye level with “Matt Snacks” in a bowl. These include homemade trail mix, rice crackers, cans of soup, and otherthings he can grab and eat without worrying if they are OK for his diet. As for the fridge, I cleaned out all of the past-date condiments, and got rid of any leftover cheese, dips, milk, and other tempting goodies. Then I organized the doors and shelves by type–being sure to put easy snacks at eye level in the fridge. These include baggies of carrots and celery sticks with individual containers of hummus and guac, Tupperwares full of clean, sliced berries, sliced celeriac root for making baked fries, goat cheese and sliced nitrate-free deli meat, and sliced peppers. The freezer got a deep clean as well and then things got sub-divided into bins. One holds meat, one has frozen veggies, one has gluten-free phase 2 frozen meals for Matt, and one has frozen fruit. There’s even plenty of room for me to make and store popsicles and homemade sauces. I always make sure to put the “need to use” first items (like meat that’s been in for a month or so) at the front so I use it up before it goes bad! 2.) Once I had a blank slate in terms of food storage, I made a meal plan for the week. This took a while since I was trying to make sure each meal coordinated with the others ingredients-wise. After all, why buy a piece of ginger for just one recipe? It will probably go bad before you get to use the rest. So I made sure that any herb or other ingredient on my list could be used in multiple meals or added to a salad. 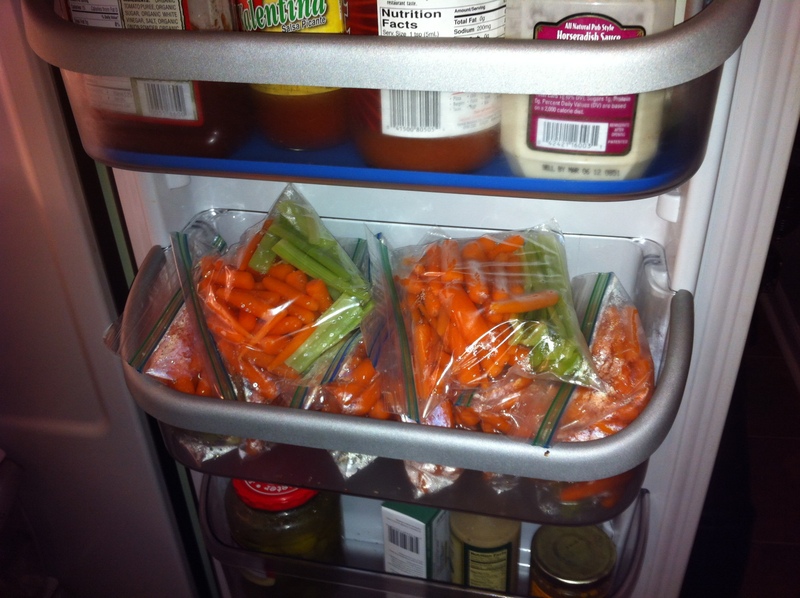 I also made sure to work in the scant ingredients left in my fridge after the “Great Fridge Clean of 2012.” I also documented breakfasts, lunches, and snacks for myself and my husband. Next, I shopped. I hit up Costco, Whole Foods, and Kroger to get all of my loot for the week. 4.) I packed my lunch the night before (and sometimes Matt’s too) and included snacks. I also portioned out vitamins and made sure breakfast was easy to find and heat up. With everything prepped and easy to go, it made life so so much easier. I was able to grab lunch and breakfast easily and din’t end up skipping meals, which meant everything got eaten instead of thrown away. And prepping dinner ingredients ahead meant I had no excuse not to cook. It helped a lot. The outcome: We threw away some pears and avocados (maybe the Costco size bags weren’t the best idea!) but we ate everything else and left to go out of town with a clean fridge. 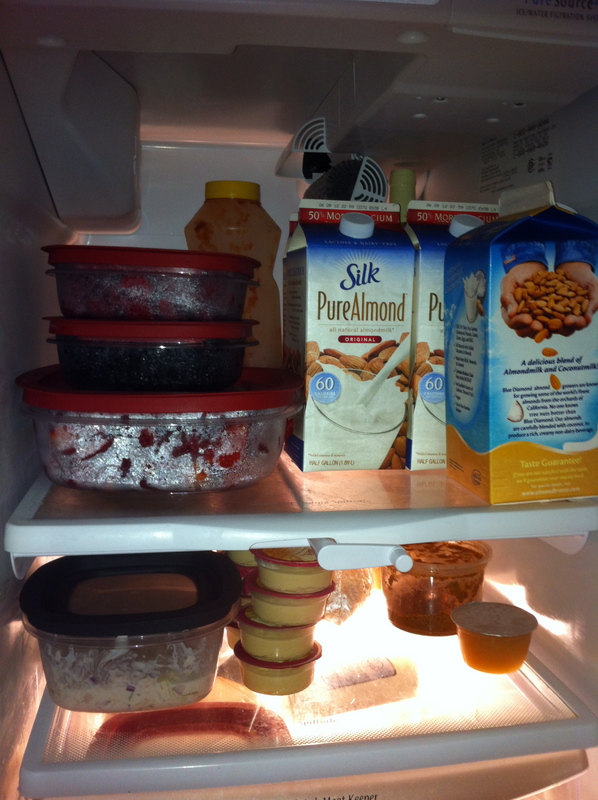 The only leftovers in there were eggs and milk that isn’t even close to expiring, goat cheese, and bottles of water. Success! I went to the grocery last night with a meal plan in mind, and even though I was exhausted from traveling, Matt and I got everything cleaned, cut up, and put away and packed lunches for today. So far, so good. We’re on track for another good week! Obviously, everyone is different, but a few hours of shopping, cleaning, chopping and organizing on Sunday have been saving me time and money through the week. It was amazing what a difference it made. Anyone else have any good tips? This entry was posted in celiac, gluten-free by mollykhodgin. Bookmark the permalink.